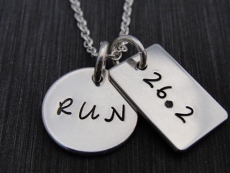 Reward someone or yourself that has achieved the goal of a marathon or half-marathon. 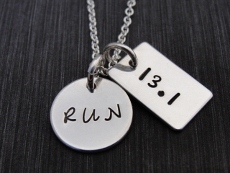 This necklace is stamped with your choice of font and has a disc stamped RUN and rectangle tag with either 13.1 or 26.2. Discs can be stamped on the back with names, times of race. Disc 1 is RUN disc, Disc 2 is Distance. Choose from 16", 18" or 20" chain. To order this item, please select a style, then click Add to Shopping Cart button.